FOR MORE EFFECTIVE AND EXCITING TEACHING! Process drama is a specific form of drama particularly suited to engaging students deeply in whatever subject is being taught. The following tools can be used singly to make a lesson plan more meaningful or in various combinations to form a complete process drama exploration. 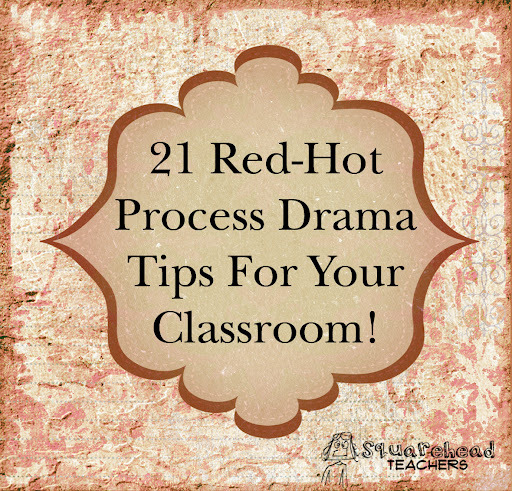 The following is a listing and explanation of several process drama tools and how they might be used in the classroom. 1. Improvisation—unrehearsed scene co-written with partner (s) without pen or paper. 2. Teacher in role—Teacher takes on the role(s) of character(s) within a drama. Teacher takes on the role of a messenger coming to warn a group of people about a plague coming to their town. Later, he/she takes on the role of the Mayor, another townsperson, or another character within the drama. 3. Still Image (Tableau)—The group takes up different poses to construct a picture describing what they want to say. (Example: A young boy during the Civil War saying good-bye to his family as he goes off to war. Students may use thought-tracking (see below) to extract meaning from the image. 6. Narration—Teacher narrates part of story or sequence of events to help it begin, move it on, to aid reflection, to create atmosphere, to give information, to maintain control. 13. Guided Imagery/Visualization—Teacher narrates part of the story while the students close their eyes and visualize sensory details. A writing assignment directly after would augment their sensory impressions. Soft music while visualizing can add depth to the experience. 14. Pantomime/Movement—Students act a part of the story using no voice. Music may add to the pantomime. Abstract movement can illustrate an emotion or sensory details of a story. 15. Soundscape—Students use voice to suggest the sounds of a certain setting within a story. 16. Interview—Students act as newspaper reporters finding out information about a scene. 17. Choral Speaking—Students repeat certain lines in unison or divided into various parts according to gender, pitch of voice, character, etc. 18. Speaking Objects—Objects in a scene speak about themevles in relation to a character or event as an eye-witness with a viewpoint. 19. Performance Carousel—Groups prepare scenes representing parts of the drama story, then arrange them in chronological order and perform them in sequence without interruption. 20. Eavesdropping/Gossip—Groups or individuals overhear conversations and report them back to others. 21. Forum Theatre—Students enact a scene. Audience can stop the drama, replace or introduce new characters to change the scene. This entry was posted in Drama, Management and tagged Children, Education, Elementary School, Kids, Teacher Resources, Teachers, Teaching by Squarehead Teachers. Bookmark the permalink.